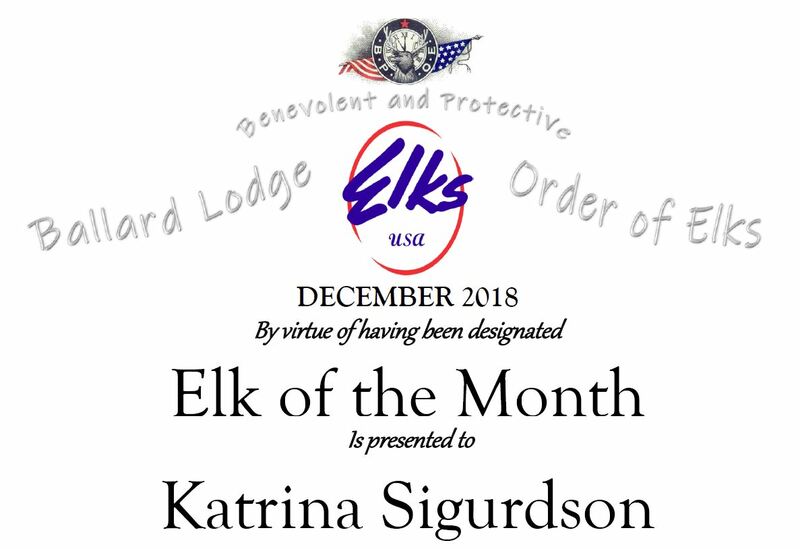 Elk of the Month – We’ve had some great nominations this year for Elk of the Month from our members but this month we have a nomination that goes beyond the one Elk one Award philosophy and opens the door to nominate a group of Elks that exemplify the reason we are here as members of the Elks. To have fun with each other and pool our energy’s together to make something bigger than ourselves. Something we couldn’t have done on our own. I was still an officer when these Elks came to us with an idea for a fun event at our lodge. 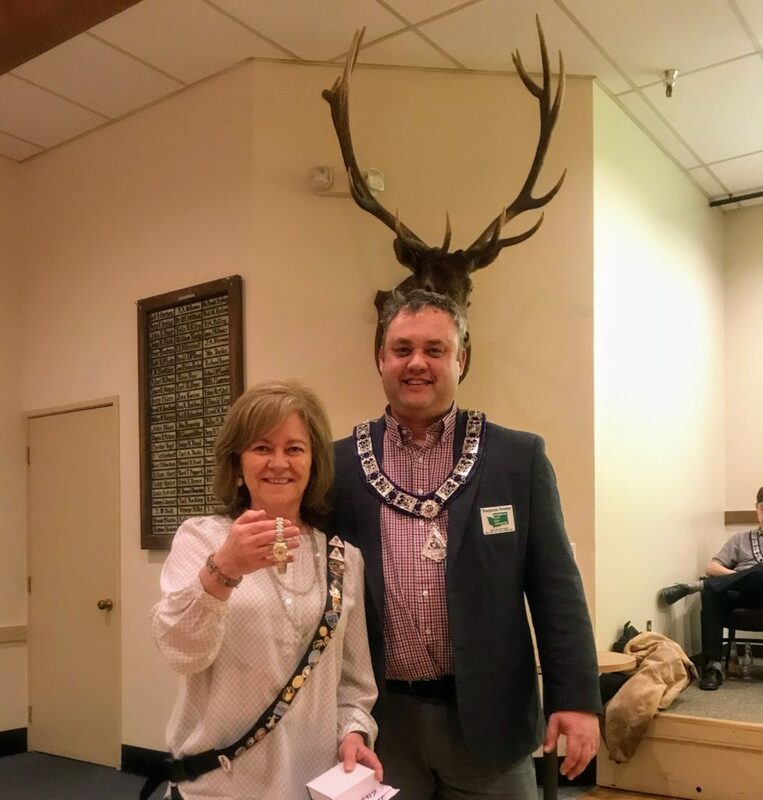 My initial reaction to their idea was along the lines of “this will never work,” and I don’t think I was alone in that reaction – But – and there is always a but, we had a group of enthusiastic Elks members that wanted to do something together to make some fun happen at our lodge and hopefully raise some funds for charity. How could we say no? And I mean thousands. 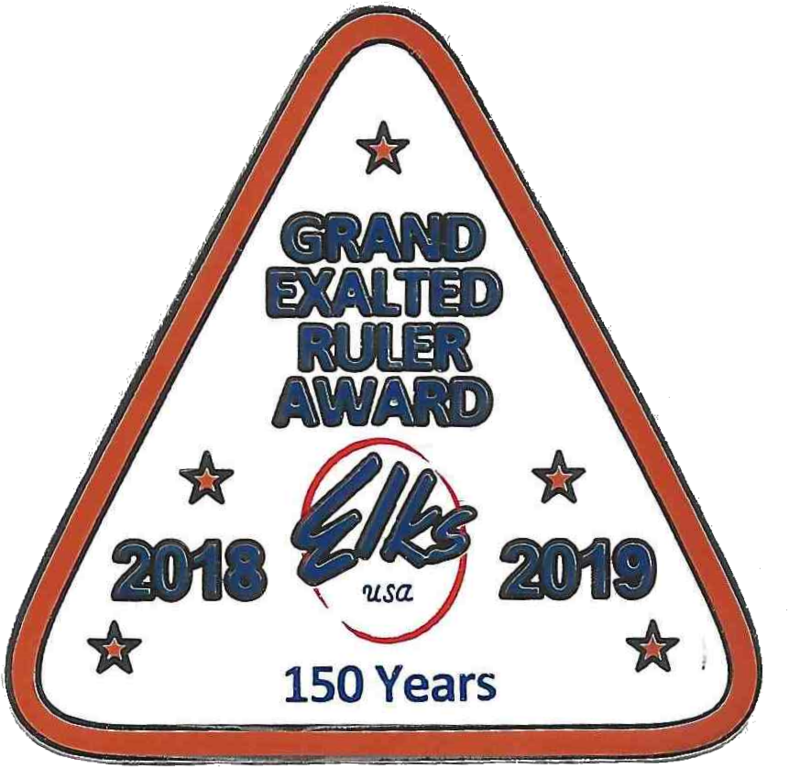 Since beginning this event in October of 2017 these Elks have not only created some amazing fun for hundreds of Elks and their guests they have raised over $29,000 for charities like Tall Elks Children’s Therapy Program, Mary’s Place, The Paradise Elks Lodge disaster relief, our Lodge Building Fund and more. In just 15 nights they have raised over $29,000 – Wow! Catherine Rundell, Wendy Sedlacek, Dee Ann Evans, April Schoen, Lisa Merlin, Jennifer Morris, Roy Ridgeway, Nicole Mathews, Allison Krieger, Jill Yerkovich – Thank you! 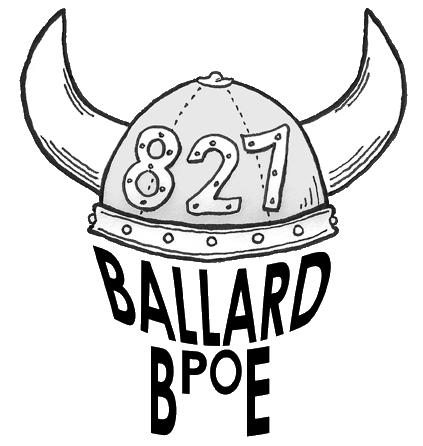 As a group you have created a microcosm of what it means to be an Elk and through your efforts are helping build the fun in Ballard and giving meaning to both your membership and the membership of every other member of our lodge by using that fun to build our charitable giving to our community. Well done and thank you. 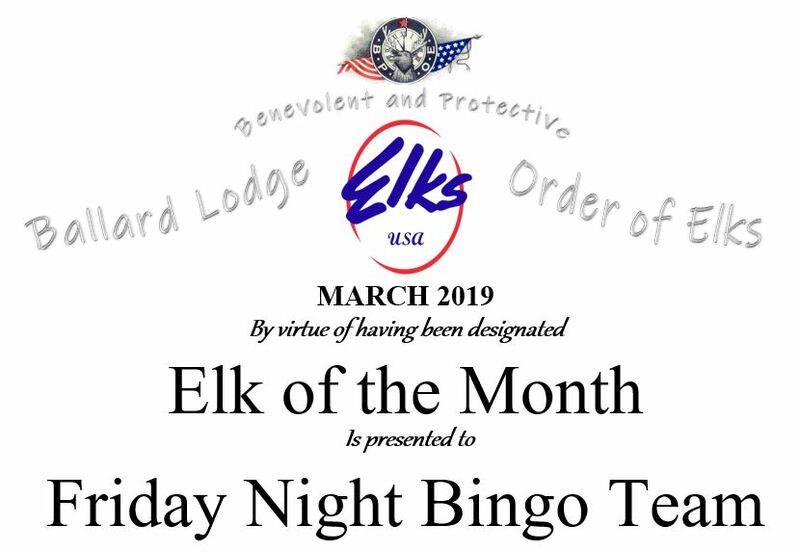 This entry was posted in The Lodge, Members and tagged Elk of the Month, Friday Night Bingo on March 29, 2019 by admin. Each month we receive a newsletter (not to be confused with the Magazine) from Grand Lodge filled with some informative and inspirational articles from our Grand Lodge officers and committee chairs. If you’ve not read it before, you find them all online here at elks.org. Wouldn’t you know it as you cruise through page one and read about some tips from our Grand Exalted Ruler, learn about prescription drug take-back day and get educated on some housekeeping items you scroll down to page 2 and what do you find there? Ballard Elks a 5 star winner for the national website contest! Well done to all the people that have worked and continue to work on our lodge website. One of many avenues we use to get information to our members and helps us have more fun at our lodge. Website, facebook, instagram, twitter, newsletter, elks.org virtual home page – you name it we are doing it and doing it well. Do you want to help out with any of these items? We need your help. 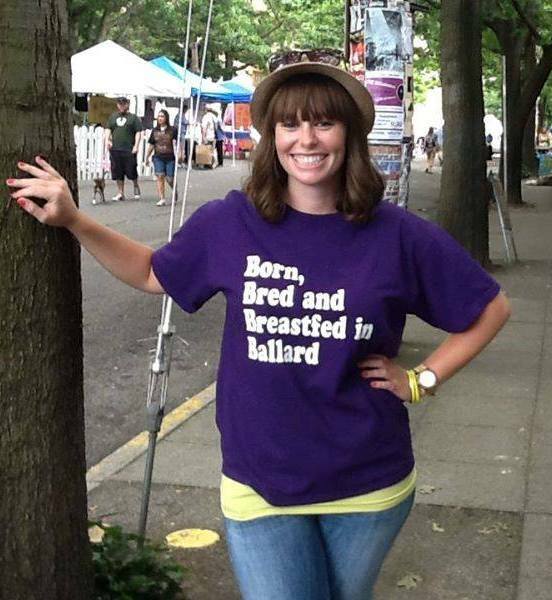 Send an email to volunteer@ballardelks.org and ask! This entry was posted in Blog on March 7, 2019 by admin. The Membership Committee is planning a new game incorporated into our Antlers Newsletter. Members who actually read the monthly lodge newsletter might find their membership number hidden somewhere inside. When the member finds their number, the member comes to the next Lodge meeting to collect $25 in person, in cash. The pot builds if it’s not claimed each month to a maximum of $300! How it works: a member number will be chosen at the second Tuesday of the month Lodge meeting by our Esquire. ((28311)) It will be recorded and then sent to the newsletter editing team to be hidden somewhere in the text of any article in the Antlers newsletter for the month after the number was drawn. If you see your number in the newsletter bring it and yourself to the next lodge meeting after the newsletter was printed to claim your prize – and don’t forget your membership card! You need to be a member in good standing to attend the meeting and therefore to claim the prize. We’ve hidden a membership number in this text as an example. Did you find it? The goal is to encourage members to receive the lodge newsletter, read the Newsletter and attend a meeting (even if it’s the only meeting of the year they attend to claim their prize!). Below is the email activity report from the February 2019 Antlers Newsletter that was emailed out on January 30th, 2019. Notice that over 1500 emails went out yet the newsletter was only opened to be read by 213 members that received it. We have to be able to do better than 213! Conversely know that the newsletter was printed and mailed out to almost 500 members at an average cost of $1.20/member. Affording to mail it everyone is a tremendous cost to the lodge so we appreciate those that receive it by email and are hoping to find an exciting way to get them read. Learn more about the Antlers Newsletter by following this link. 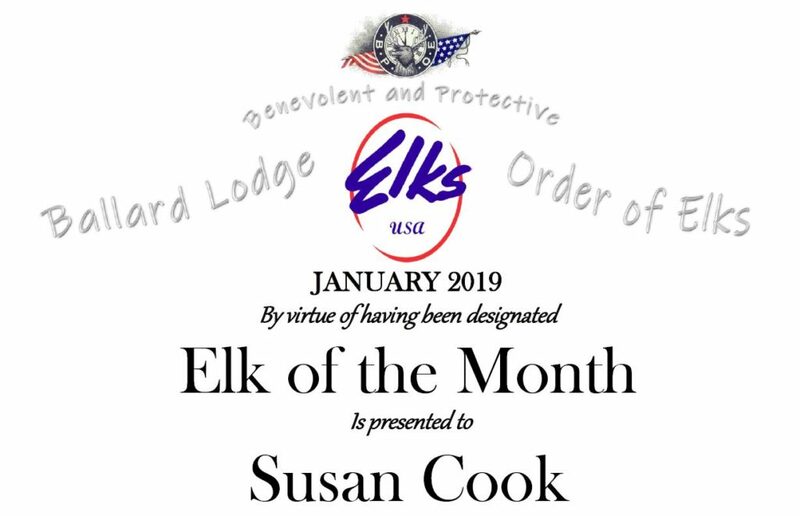 Elk of the Month – We love having members nominate their fellow members for the Elk of the Month Award and this month we have a long time member of 13 years being nominated by a fellow member for the consistent behind the scenes work this member has been doing for years. Lorraine (Lorie) Ferguell is one of those steady and reliable volunteers who shows up for the essential jobs that just have to be done every month. She has been working with our lodge secretary for years taking money and getting people registered on interview nights. She’s been maintaining an email list to send out Antlers every month. Involving not just keeping a list available, but chasing down email addresses that bounce back because they were illegible or changed, adding new contacts each month, and battling with the email server data limits to allow the high volume of emails to go through. 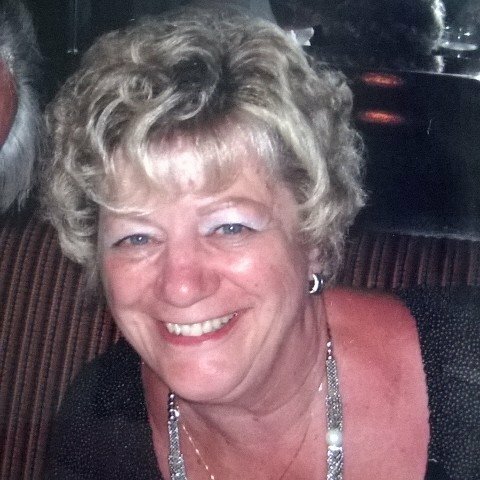 Lorie is consistently ready to help and has capable hands for whatever little tasks need doing around the office or around the Lodge. At a recent candidate interview night, she got a rag and crawled under the lobby display table to dust because she could see it needed it! She also noticed that it would be really nice to have a wall clock in the lobby on interview nights, so she went out and found a nice one and got it put up. 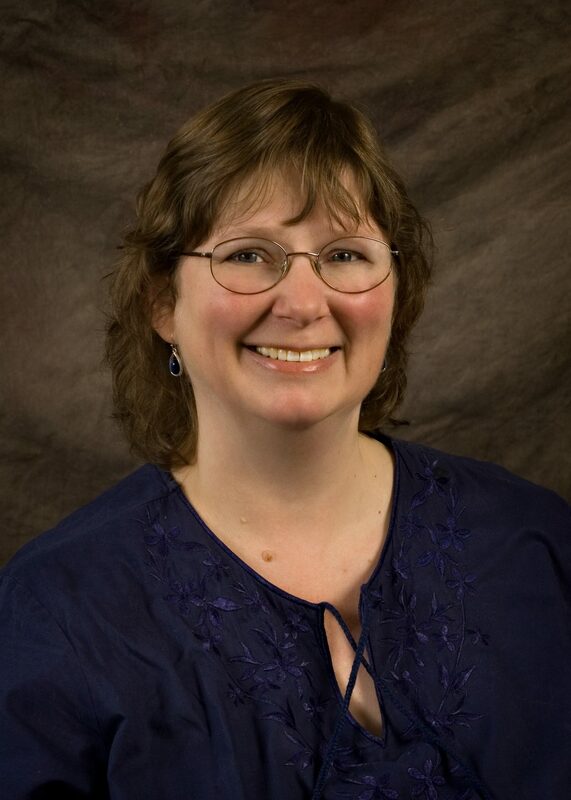 Lorie is a warm and friendly face at all the Lodge events, and her ‘get ‘er done’ attitude really helps things run smoothly in everything she tackles. 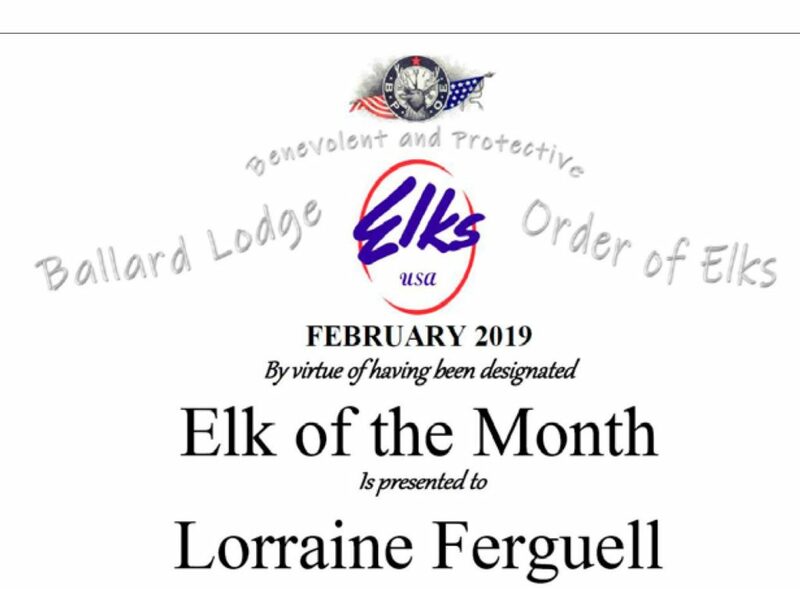 Lorraine Ferguell’s consistent efforts year after year shows us, once again, that there is no more important person at an Elk Lodge than the member. We, as a lodge, cannot continue to function at a high level without our members volunteering their time and doing the hard work that keeps our lodge open for everyone to have fun at. This is exactly the kind of active and engaged member that deserves the Elk of the Month Award. Thank you for all you do Lorie – keep up the great work! Do you want to have some fun with fellow Elks? Do you enjoy acting, meeting new people and going to fun places? Do you enjoy competition and want to represent your lodge? 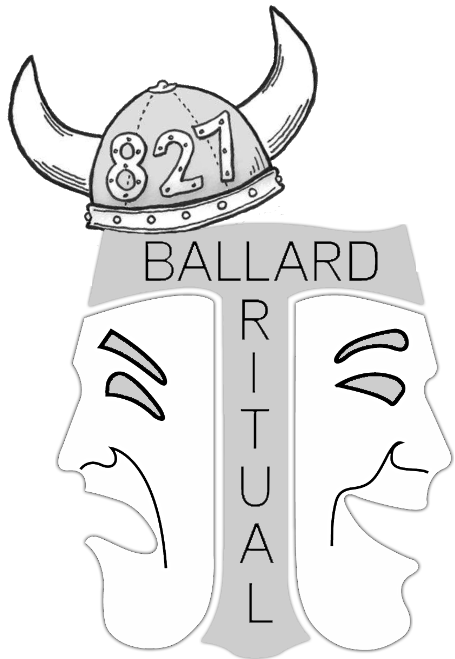 If you answered yes to the above questions We Want You to help us create the Ballard Elks Lodge #827 Ritual Team. Positions from coach & choreographer to acting positions of Exalted Ruler, Lecturing/Loyal/Leading Knights, Esquire, Chaplain, Inner Guard, fundraising and more are needed. 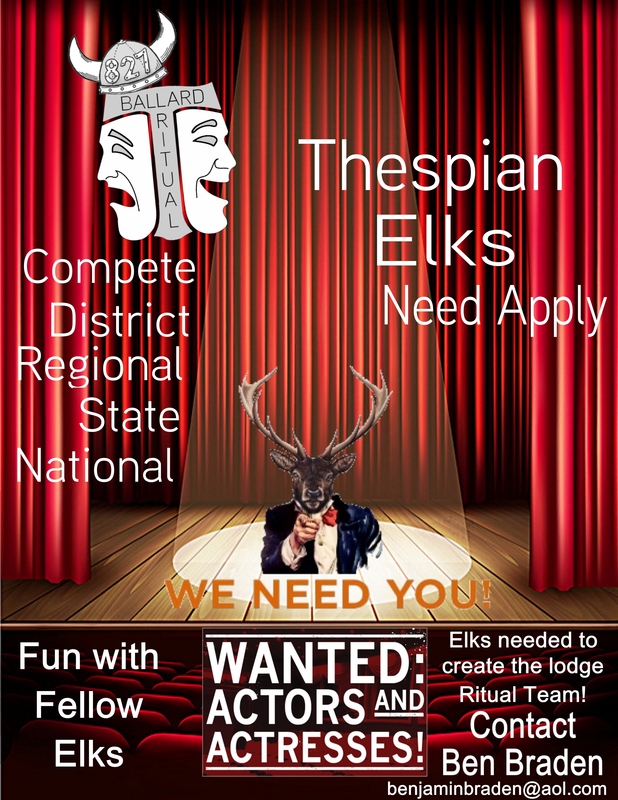 Let’s have some fun at the lodge and create a ritual team to represent us at district, regional, state and national competitions. Enjoy our initiation ritual, connect your talents with our lodge, build pride in your membership and create pride in your fellow members by you competing for our lodge at ritual competitions. Below are four members that our Grand Exalted Ruler Micheal T. Luhr and your lodge membership committee would like to thank and congratulate for meeting and some exceeding the membership award goal of bringing in 3 new or reinstated members to our order. 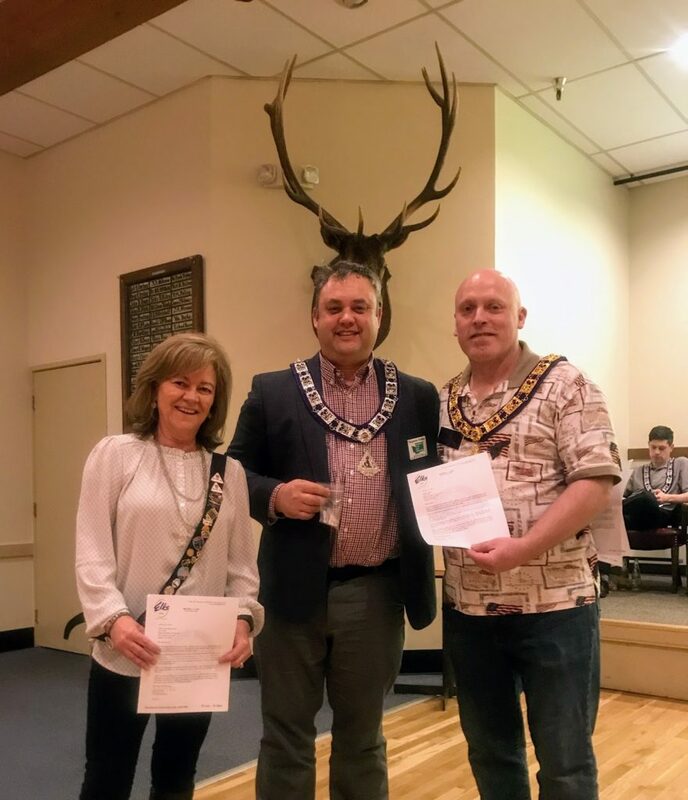 These awards were presented at the regular lodge meeting on February 12th, 2019. Received an Elks watch for bringing in 11 new members during the Grand Exalted Rulers term in office. 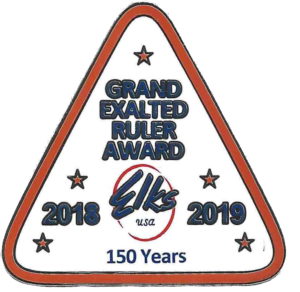 Elk of the Month – For December the Past Exalted Rulers Association would like to recognize a 9 year member that goes above and beyond helping each and every year. This member puts in countless hours organizing and hanging our lodge Christmas decorations each year. She consistently helps out our fellow Past Exalted Ruler Johnny Muzevic with our Christmas Basket Program and goes out of her way to help organize, schedule and staff our lodge hoop shoot event held at the Boys and Girls Club. Over the years Katrina has organized some super successful and fun events like a corn hole tournament and a beer pong tournament. For those of you lucky enough to have been at them you know how fun they were. She helps with centerpieces for Veterans Day, helps with our officer installation efforts and helps set up and tear down and has spent countless hours cleaning everything from our catering kitchenette to the social quarters. Katrina Sigurdson’s consistent efforts year after year shows us, once again, that there is no more important person at an Elk Lodge than the member. The Member that channels their passion into an event at our lodge that raises funds, creates a fun event for our members & guests and ultimately supports our community. This is exactly the kind of active and engaged member that deserves the Elk of the Month Award. Members empowered through our lodge use our resources to do great things. Thank you for all you do Katrina – keep up the great work! This entry was posted in Blog and tagged Elk of the Month, Katrina, Katrina Sigurdson on December 27, 2018 by admin.